What a stunningly beautiful February day. The sun is shining like crazy and there is snow piled high on tree branches and fence rails. The birds even look happy. They flit about with joy and a spring in their step. Just 2 more days until Valentines day and the anticipated arrival of our newest little family member. We are just so excited. I’ve spent the last few weeks on custom work for a few of my customers. Becky was looking for a luxury baby gift with a difference. We decided on a hand spun Angora and silk handknit baby shrug and matching hat. I call it Whisper. I searched through some of my vintage pattern books and online at vintage knitting site. Inspired by some of the vintage looks and a piece that I did a few years ago I came up with Whisper. 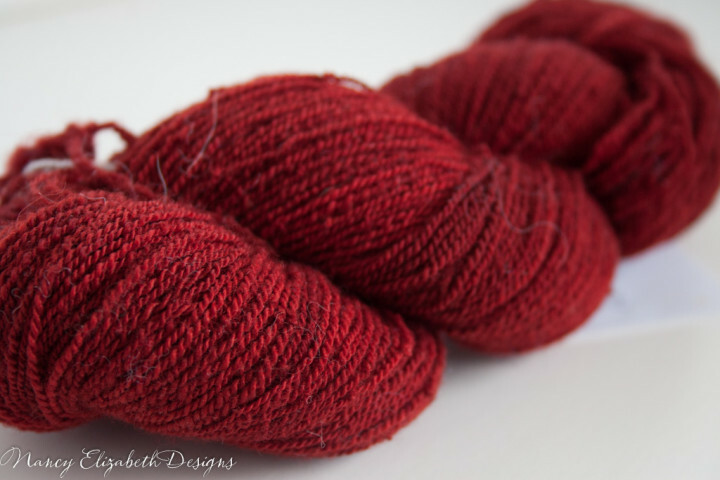 The yarn is an amazing mixture of Angora fiber and Silk. They are so different in texture and appearance but come together to make a truly one-of-a-kind yarn with the best of both worlds. The fabric is fluffy and soft with a gorgeous halo but also has the added strength and unmistakable shine of the silk, not to mention the crispy feel that crunches like footsteps on very cold snow. It is tied at the neckline with a delicate pure silk ribbon. 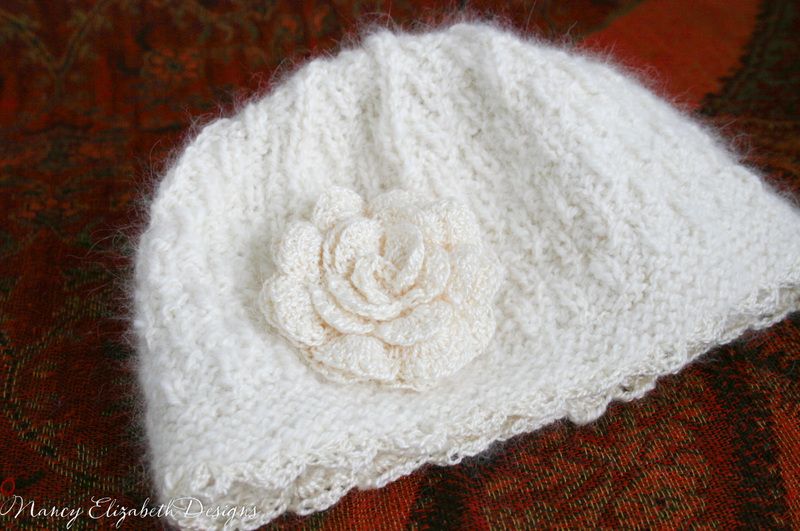 The hat is loosely based on a beret style hat from an old SRK pattern that I have loved over the years. It is the sweetest little cardigan and hat set in Marble. I looked for the pattern for days and days and I just couldn’t find it anywhere. Finally a wonderful friend on Ravelry sent me a scanned copy of it and saved the day. I promise we didn’t infringe on any copyrights as I really do own this one, just can’t seem to remember where I put it. The lace edging and the rose are hand crocheted from some very fine 100% handspun silk. I knit a pair of casual socks for Carolyn. They were to have a casual look and go with her jeans. I am thrilled to report that she was very happy with the resulting socks. Richard wanted the Turn a Square hat by Jared Flood (one of my own personal favorite designers). This project was a treat to knit and I was finished the first one in just a few days so we decided to knit another one with the colours reversed and it turns out that 2 of these hats can be knit with 2 x 50 gram balls but don’t do any extra rows as I only had about 1 yard left over. Jamie asked me to spin some camel and silk yarn for her to knit a jacket for her brand new grandson in size 2. Congratulations Jamie and family! I finally finished the Nube Garter Stitch socks and the Alpacalicious slippers with the leather soles and they have already been gifted. I am working really hard to get some of my special hand knits listed here on the web site and in the Etsy store. Today I got 2 more really special Angora garments listed that would be perfect for baby gifts. One for a baby boy and one for a baby girl. These are both one of a kind garments. There is no pattern available yet and I have not knit them again in any other form. Each was designed specifically for that particular special garment. They are both luxury items which would be perfect heirloom gift. Ok, enough talk, lets see the pictures! 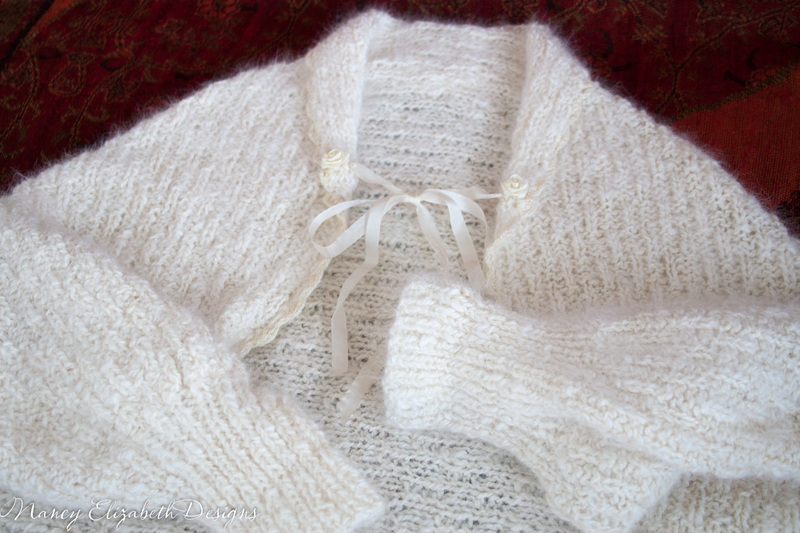 Sneak Peek Angora baby sweater coming next week for sale here in the shop and on Etsy. One of a kind Angora rabbit baby sweater handknit in the softest and finest handspun and hand dyed angora yarn. This is definitely next to the skin soft! An original design that I created just for this cardigan so it is truely a One of a Kind (OAK) garment. The front band features 5 handmade buttons. 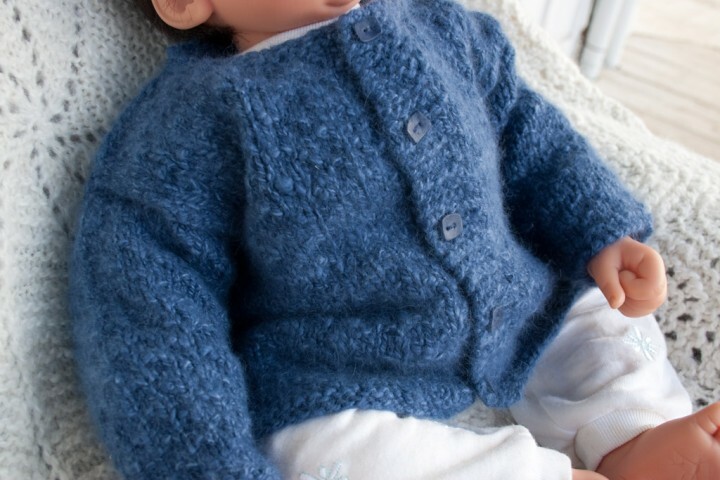 A very special little sweater that would make a wonderful heirloom quality gift. 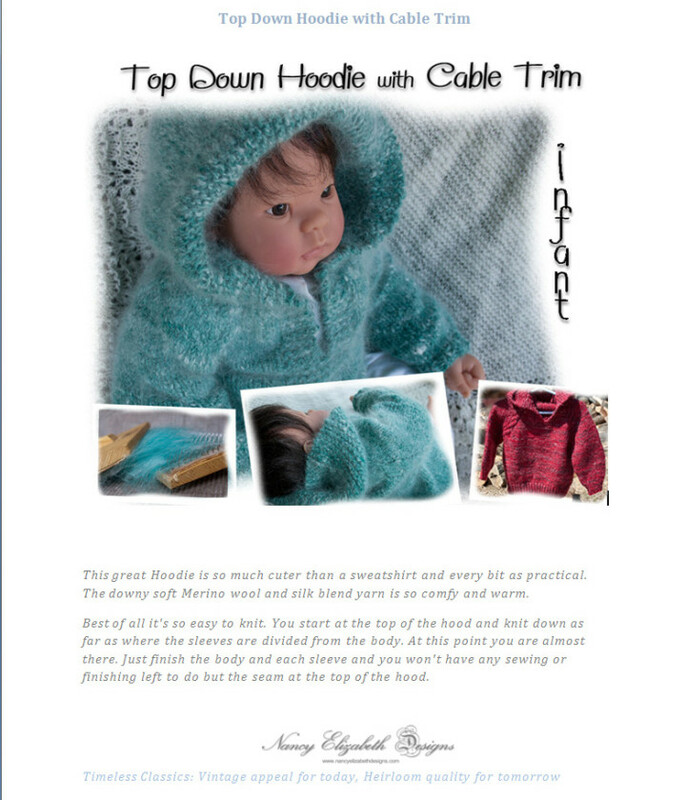 I reached a goal today with the completion of the Hoddie with Cable Trim pattern in Infant sizes. I now have 3 patterns finished but they still need to be posted with pictures and stories. I’ll put them on My Own Web Site – Nancy Elizabeth Designs , on and Etsy and Craftsy as well as Ravelry. I really love the Hoodie, in fact I’m going to do one for myself to test the adult sizes. I think I will add an afterthough front pouch.